The online auction description was brief: 'Old unfinished quilt, some holes, has printing with word Harrison, good for cutter.' Oh really... A quick scan through the pictures and I started checking my wallet. Fortunately, I had only one rival who dropped out early and the quilt top came winging to my door, ignominiously swathed in a black plastic garbage bag and duct tape. When I de-bagged the quilt top-what joy! It was what I'd hoped: an 1840s relic about which the seller was totally ignorant. He hadn't recognized that 'Harrison' meant President William Henry Harrison, our 9th president. Nor that the log cabin images and whiskey barrel were all part of Harrison's campaign. 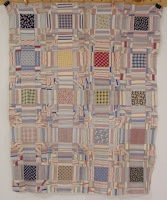 What was likely cut up in this quilt top was a handkerchief from Harrison's 1840 presidential campaign. 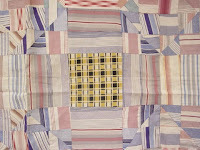 The quilt top was made in the English manner , that is, whip-stitched over paper templates. Harrison was one interesting guy. He started out as a young man in medical school but ended up as a life-long soldier and earned the moniker 'Tippecanoe' in Indian wars. Later the name was part of the first American presidential campaign slogan--"Old Tippecanoe and Tyler too!" (John Tyler being his VP choice.) He also fathered ten children! Harrison gave the longest inauguration speech on record, a thundering one hour and forty five minute declamation, delivered in a blowing snow storm. 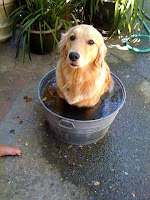 If you need reading matter to send you sleepy to bed, you can find that text here http://www.bartleby.com/124/pres26.html . Harrison also stood for hours and greeted well-wishers at the White House inauguration party. No wonder he caught pneumonia and was dead 32 days later. I wonder if the quilt top was put away when President Harrison died so suddenly? 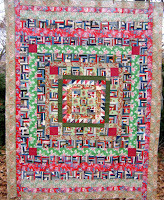 PS-if you're an antique quilt nut, scroll down to the 'pin-up quilt' at the bottom of this page. This quilt top was going great guns and then...the quiltmaker put it away and forgot about it? Or her fiance was lost at sea and she hadn't the heart to finish? Who knows! We could write volumes of fiction about the "what if" of our UFO's -unfinished objects to the non-quilters.